The world of Minimondos celebrates individuality and brings together imagination, fun and stylish design to a child’s toy shelf. 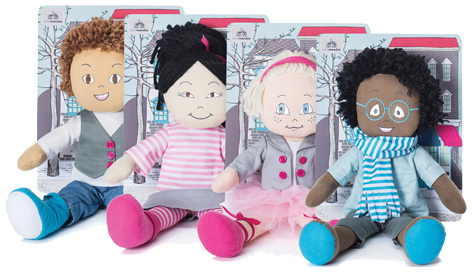 With distinctive personalities and a unique sense of style and expression, each Minimondo doll brings bundles of personality to the experience of play. They are beautifully designed with care and style. Using a sophisticated colour palette of warm greys and blues, a range of wonderful illustrations and high quality matt finishes and textiles, they are crafted to stand apart visually from the rest of the industry. Sophie is a brilliant conversationalist. This little girl is clever, persuasive and inspiring to all. Rafi is a mini spiritual oracle. A child possessed of endless wisdom, knowledge and hope, while maintaining an aura of spiritual cool. Luca is a dreamer and entertainer extraordinaire. He is emotional, creative, and quite outrageous at times. Please tell us what you think of the Minimondos Dolls by Asobi.